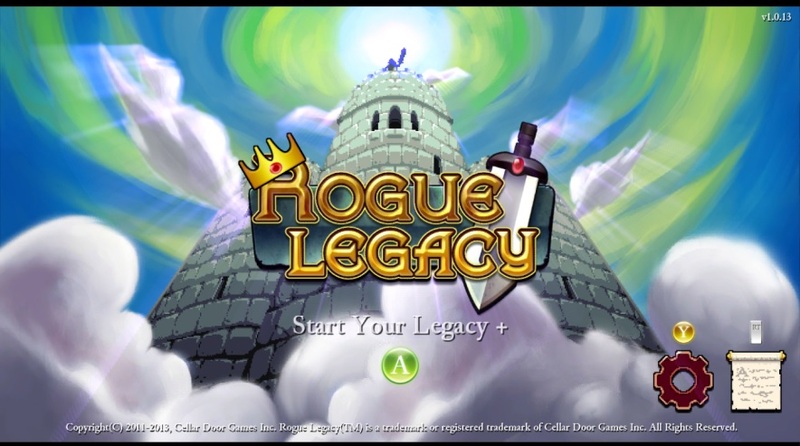 After defeating the final boss in Rogue Legacy, the game begins anew in "New Game Plus" mode, this title's version of a second quest. The gameplay is mostly the same, except that all monsters have higher stats across the board, dealing lots more damage and possessing significantly more health. 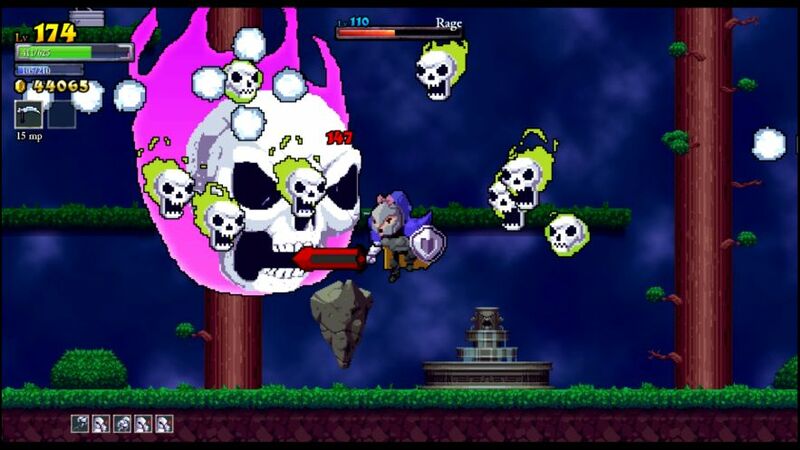 The monsters also upgrade to the next "tier" of the same type, if that makes sense, so instead of the basic skeleton archer who shoots one arrow, you're facing the palette-swapped upgraded version that shoots two arrows, and so on. Some of these upgraded monsters are noticeably tougher than their basic counterparts, and there are some enemies who don't appear at all until you replay the game a second (or even a third!) time through. 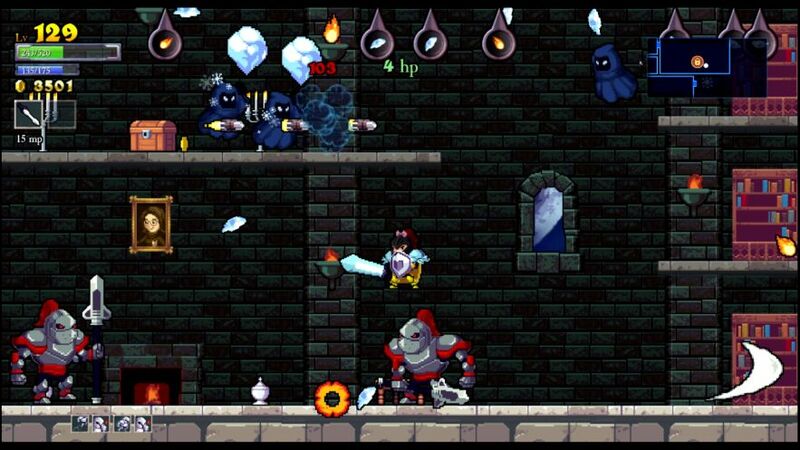 In addition to this, only about half of the game's equipment will drop in the initial Normal trip through the dungeon. You will never find the more advanced weapons and armor without playing on New Game Plus mode, which is part of the reason why I feel as though the game isn't truly finished until it's been beaten more than once. There was still tons of new and improved gear sitting out there waiting for my Paladins to find. 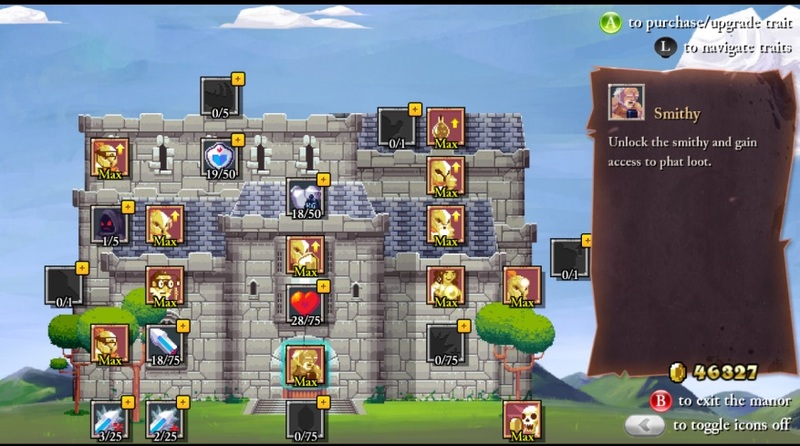 To help you in your quest, your character carries over everything from the previous playthrough, all of the same equipment and upgrades and runes and so on. 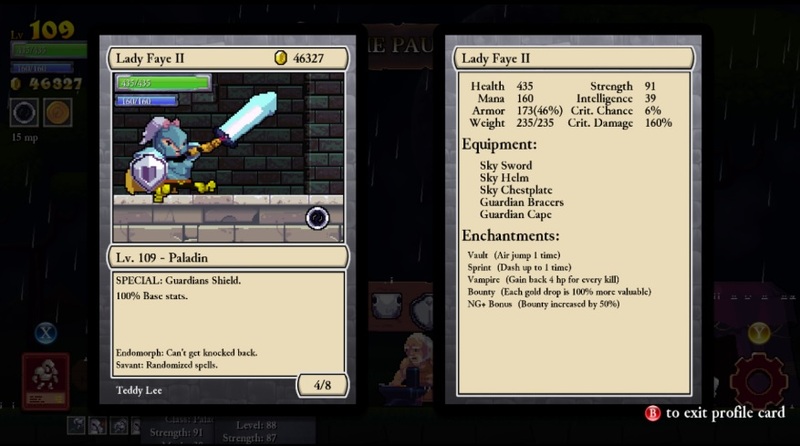 You even get to use the money from the final boss kill, and indeed Lady Faye II here was sitting on a nice bankroll of some 46k gold. This screenshot also shows all of my Paladin stats at the time of completing the Normal runthrough, with an equipment set largely comprised of the Sky and Guardian gear. That's about as good as you can find without venturing into New Game Plus mode, from what I've seen. Note as well the NG+ bonus for gold: each new trip through the game grants an extra 50% bonus to gold, and that was on top of the 50% passive bonus that I had from upgrades. Each gold coin was now worth 20g! Plus more gold drops in general in NG+ difficulty, which means that my highest run total from the previous difficulty was likely to be shattered here, assuming that I could survive in the dungeon for any length of time. This was still Paladin #21, since Lady Faye survived the last run in Normal mode. How long would she survive here? All of the enemies in NG+ mode have so much higher damage and health values, it's always quite a shift to start out anew in the castle sections and have such tough encounters. 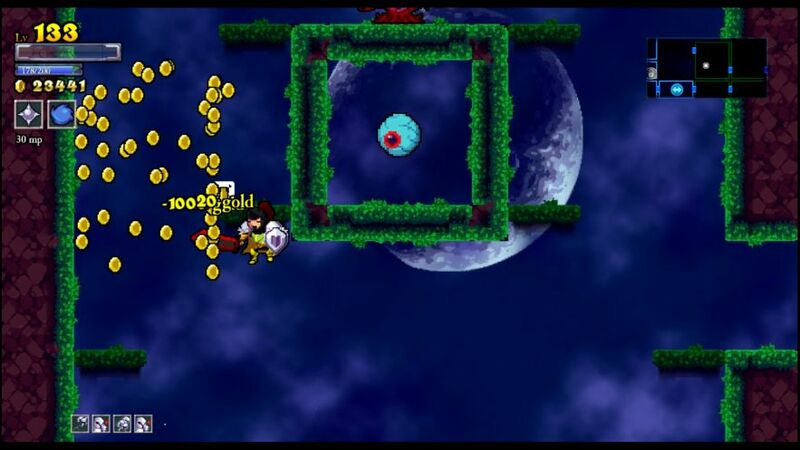 Of course, the gold gains are also much higher too (every coin worth 20g) and the treasures are equally more valuable. I found the Dragon Bracers early on, something that I believe can't even drop unless playing on NG+ difficulty level. 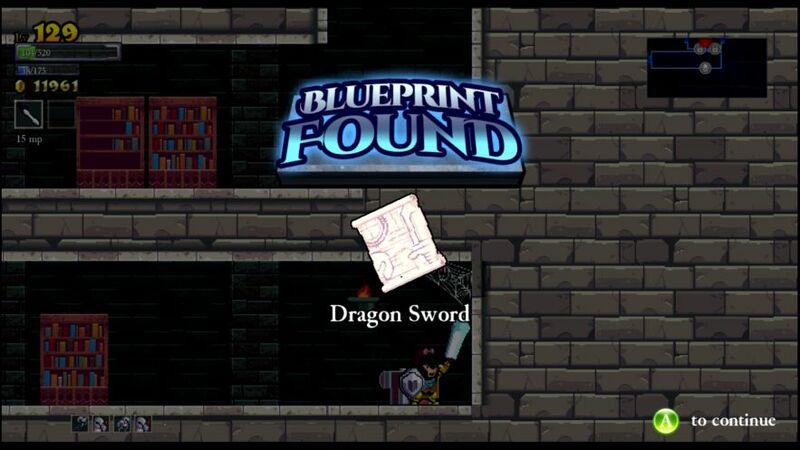 The Dragon Helm was waiting just outside the castle boss door, no desire to fight Khidr on this run though. Still in the castle, I found the Royal Bracers and the Imperial Helm later. This was turning into quite the run for finding new equipment. I cleared out the castle and a decent chunk of the forest before finally falling to a skeleton bone thrower. Pretty decent run overall. All of the gold went towards using the new gear, and even then it wasn't enough to purchase all of the needed equipment weight. (Needed six upgrades there and only had enough for four.) Dragon Helm and Royal Limbs were both huge improvements to the gear; in total together worth +35 health, +15 mana, and +50 magic damage. MAJOR weapon upgrade, +19 damage. Finally died in the forest in shameful fashion after clearing the castle. Considering how dreadfully low this character was on health for virtually the whole castle run, this Paladin was more successful than she had any rights to be. I was now using the Dragon Sword and Dragon Helm as the main equipment, and swapped over to the new Holy Chestplate. This was almost identical to the former Sky Chestplate, granting +25 MP and +1 Siphon at the cost of -8 armor. 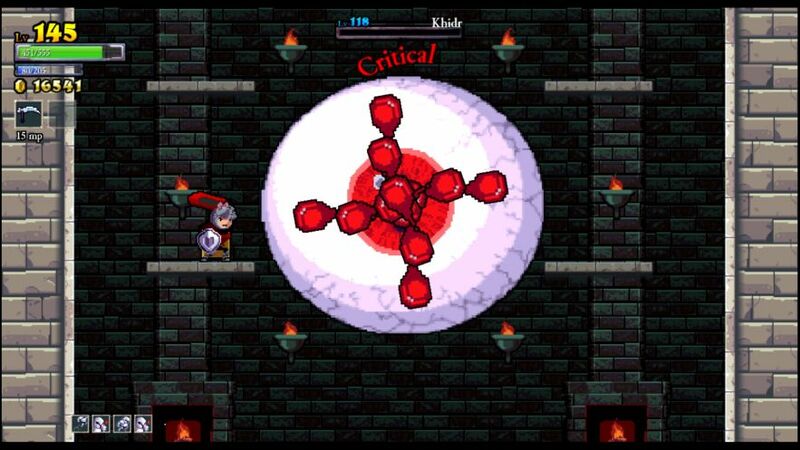 Sipon is the magic point version of Vampirism in this game, granting extra MP back after each monster kill. Although it wasn't too terribly useful for a Paladin, the Holy armor was simply better. I still needed two more Equip Up points to pick up the Royal Limbs, and I was hurting for a new Cape too, although the Guardian Cape's +27 armor was not terrible. 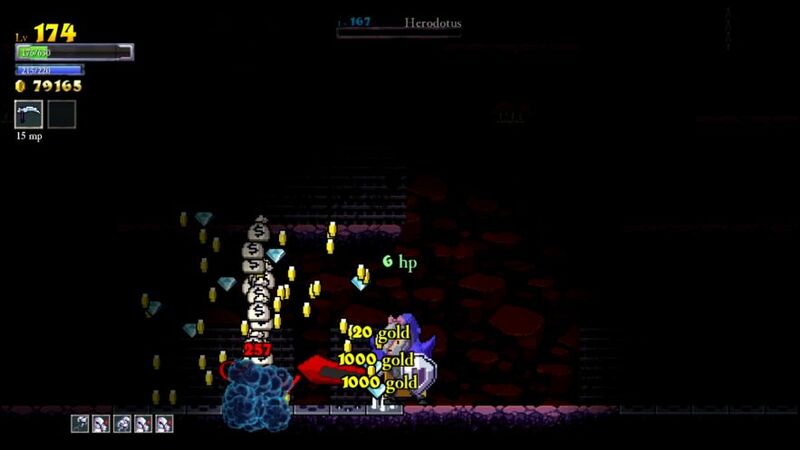 I absolutely hate this mechanic, since you have to go and pick up the gold that you lost, and then while picking it up you often take more hits, and so on. Supposedly you gain a slight amount of gold if you pick up everything that falls, but I still hate this mechanic nonetheless. Really, really annoying. I was able to ditch this eventually by grabbing the Hermes Shoes at another shrine later in the forest, thank goodness. This became a very long run - fun stuff guessing your life total with no health bar - that full cleared both the castle and forest. That led to the discovery of the Royal Helm and Dragon Chestplate in the tower, very nice finds indeed. Eventually died in the tower, but not before ending up with the highest gold total of any character yet. After turning most of that gold gain into unlocking the new equipment (and the Equip Up to use them), the rest went into stat upgrades. My Paladins were currently outfitted in a combination of Dragon and Royal gear, with the Guardian Cape for a little more bonus armor. Oh, by the way, I found a way to improve the picture quality for these reports. I decided that I would just record every single playthrough with FRAPS, and then grab screenshots from the video feed afterwards. It worked like a charm, and made it infinitely easier to capture those "action moments" like you see on this page. Good stuff. Baldness, Coprolalia. These are both non-traits, the latter one causing your character to swear when he/she takes hits. I killed the Botis miniboss early in the castle and barely even took any damage, landing the Imperial Chestplate in the resulting treasure drop. I've gotten much better at doing that fight now that I know his pattern. This character seemed more than ready to take on Khidr, and I ventured into the first boss room after clearing most of the castle. I used the Paladin shield to block many of the incoming projectiles and generally stood on the left platform wailing away on the big eye. The battle went extremely well and I walked away after losing only about 100 HP. The rewards were two +5 HP upgrades and one +5 MP upgrade. OK, not great. I also picked up a Vampirism rune in the forest for the Bracers slot - finally something worth using there?! I had been running with only four runes for the entire game thus far. Later in the forest I came across the Royal Chestplate, which is practically best in slot for the game there. Very nice indeed. Cleared all of the castle and forest along with about half of the tower before finally biting it. The 58k gold earned (another new high) bought my next heir that Royal Chestplate, a third Vampirism rune for that final rune slot, and then a whole bunch of upgrades. Muscle Weakness (no knockback) and Tunnel Vision (no warning of projectiles outside the screen). Traits could be a lot worse than these. I found the Imperial Cape almost immediately on this run, in the third room. I honestly don't remember what that does, it might or might not be useful. [It wasn't.] One interesting thing about this character was the lack of any knockback on hits, which truly did make the dungeon a lot harder. I took significantly more hits from fast-moving enemies for this reason. Screwed up horribly in the forest and couldn't make it back to all the chickens outside the boss rooms before dying. Awful run. Alektorophobia (fear of chickens). I actually got two random zombie chickens in the first three rooms, sadly wasted since my Paladin was already full health. 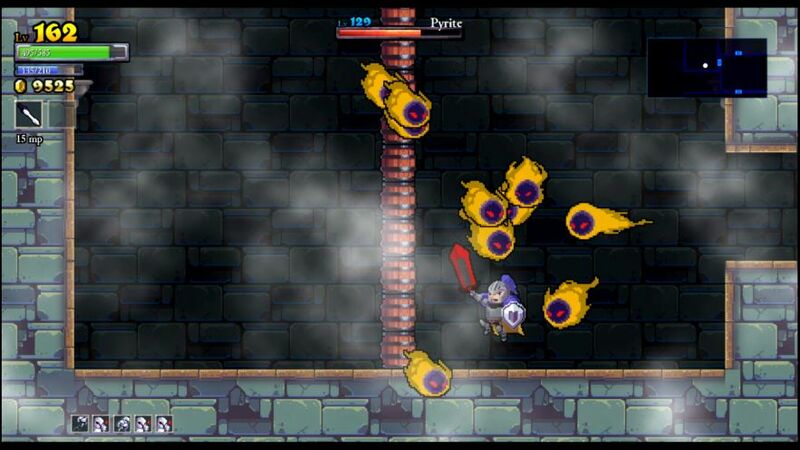 Went into the tower early on, there was a room full of an insane number of flying enemies in there (pictured above). I cleared it out while taking a few hits, not really possible to avoid that even with the shield. The Slayer Bracers appeared in a chest near the top of the tower, not sure if that's an upgrade or not. I rarely see the Slayer gear. Also landed the Royal Cape just outside the boss door in the tower. This became the first character in NG+ mode to clear out the entire tower, and I was able to keep going for some time afterwards thanks to a very convenient fountain refill. Ended up clearing out all of the castle, forest, and tower, as well as venturing down into the basement for the first time. I tried to fight Alexander (forest boss) at the finish, only to fail miserably and die. It was a winnable battle, I didn't execute it very well. The Slayer Limbs did indeed prove usefu, with crit chance and retaliation damage, and I swapped over to them. I unlocked my new capes as well, but did not equip them for the moment. Gigantism, huge Paladin character. With the attack upgrades I purchased from the last run, my Paladins seemed to have crossed a jumping point of sorts in terms of enemy health, as many foes who had previously taken three hits to kill now only needed two, and similarly from two hits down to one for other monsters. 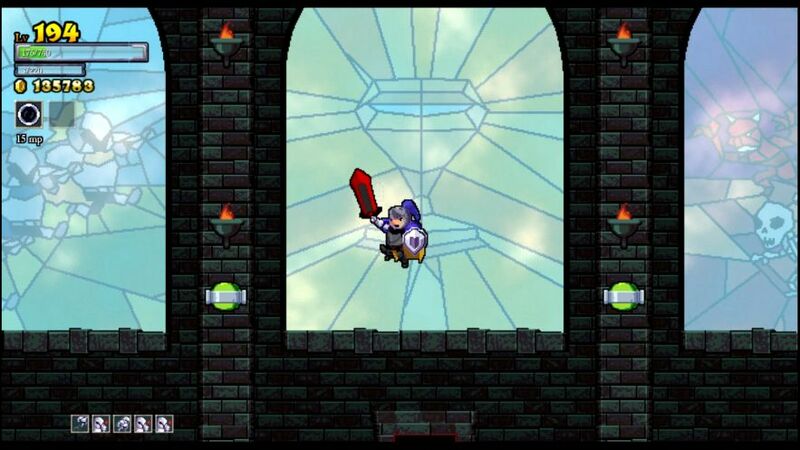 This made the dungeon noticeably easier, not to mention having that enormous sword to play around with. Picked up the Slayer Chestplate outside the boss door in the tower, which may or may not be an upgrade. I also found the Botis miniboss in the tower again, and killed him without taking a single hit for a +1 Strength bonus. Poor Botis was stunlocked for most of the battle. There were two crazy rooms on this run, one in the tower that was more packed with monsters than anything I've ever seen before (above). Sheer insanity. Then there was a tiny room in the forest with about eight of the blob enemies, which each kept splitting into smaller and smaller pieces. There was blob goo everywhere, and the lifesteal off them refilled my lifebar to full. This character also fought and beat Alexander, although it was not a clean run, more of a tanking and hacking through his damage. I received one HP bonus and two MP bonuses for winning. Then I fought the double skeleton miniboss, which went decently well, but sadly offered up the badly obsolete Guardian Chestplate. I guess they can't all be good drops. This was the first NG+ character to full clear the basement; I fought Botis again down there, and killed him in return for the Holy Bracers. Finally, in the back corner of the basement, I discovered the Slayer Helm in another chest. This run also picked up lots of runes that I won't bother to mention. With nowhere else to go, I went ahead and fought Herodotus (basement boss) as well, and even though it was a very sloppy fight on my end, the basic strategy of taking care not to have too many blobs on the screen at once was enough to carry me to victory. The reward was an Armor, Strength, and HP bonus. The only remaining opponent to face was Ponce de Leon, who quickly killed my low health Paladin. Fabulous run that brought back 89k gold and a ton of loot. Despite all that new gear, I didn't end up using any of it, heh. This character isn't doing that much with critical strikes, which made the Slayer gear weaker than the Royal equipment. I now had 14/15 of the chestplates and limbs. 89,000 gold also bought a LOT of upgrades. This Paladin rolled Dextrocardia (swapped HP and MP), which was a crippling blow. I now had 725 MP and 220 HP instead of the other way around. Whoops. I simply tried to clear out as much as possible with this poor fellow and planned to take on the bosses with the new heir. That wasn't very far, as this character died almost immediately in the tower. Weak limbed, no knockback. The health bar seemed enormous for this character after the last one! I planned to take on Ponce de Leon with this character, and did so very early on, winning with a full 570 health still remaining. Not exactly a close fight. 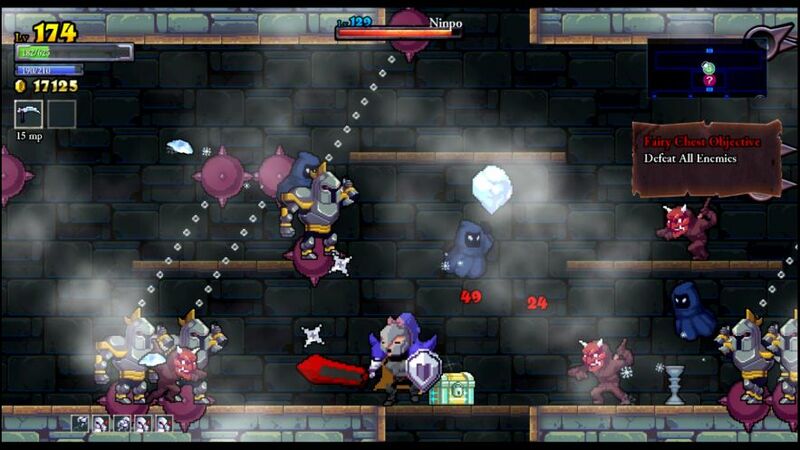 Rewards included bonuses to strength, health, and armor. After that, I took my time clearing out the entire dungeon, finding the Slayer Sword and a whole bunch of runes in the process. I always enjoy getting a complete dungeon map, not to mention picking up 110k gold in the process. 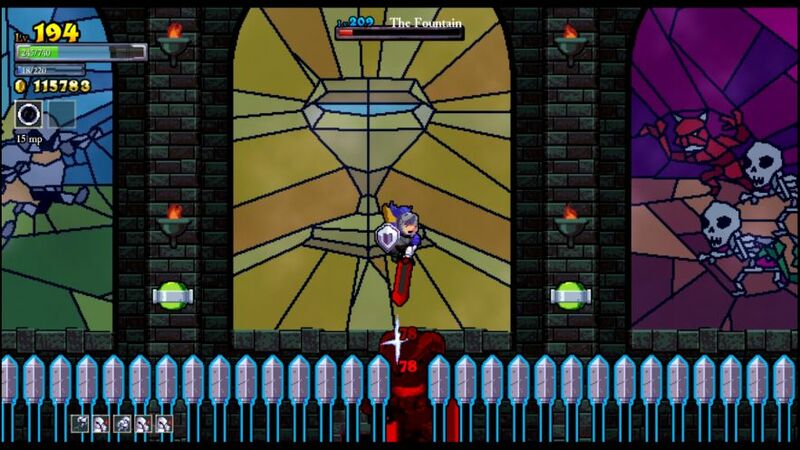 Then it was on to Johannes, who was significantly harder to kill with no knockback whatsoever. He kept jumping into me, and normally the sword would knock him back to allow my Paladin a disengage, but instead we would both take damage. Blargh. This was counterbalanced by The Fountain being easier to defeat, amusingly enough. I kept my distance, tossed a lot of chakram, and used the shield to block his flying daggers attack when I expected to get hit. 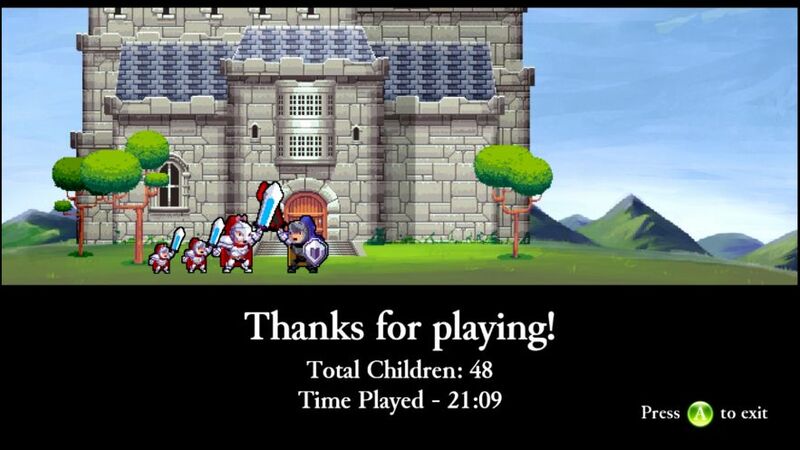 Although the battle was relatively close, I won without having to sweat out the ending too much. That meant a completed New Game Plus, and my new personal best of 135k gold brought back on a single run! In the end, it only took nine total Paladins to clear out New Game Plus mode from start to finish. That was a very noticeable improvement, and that total of nine included the horrible Dextrocardia roll character who achieved virtually nothing at all. From here, it was on to the final challenge in New Game Plus Plus (Double Plus?) 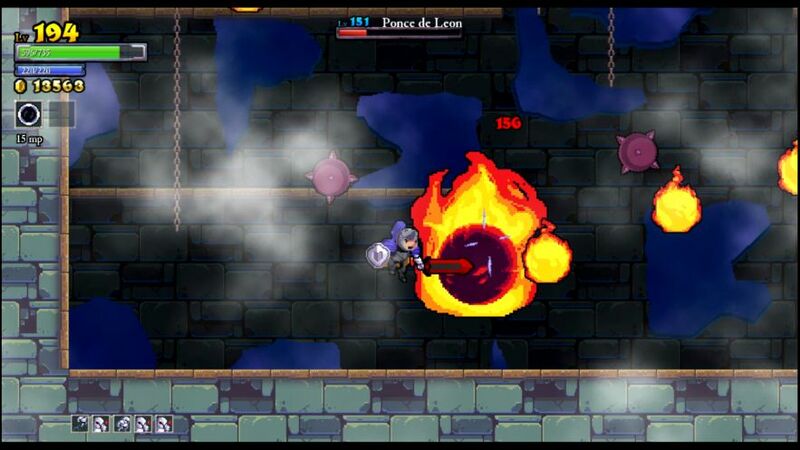 mode, Rogue Legacy's version of Hell difficuly. All of the monsters would be upgraded to their highest form, and the challenge factor would be upgraded yet again. It was time to lead this family of Paladins to one final victory over the cursed Castle Hamson.